It really felt like spring today. And then it felt like winter. Then summer. Then winter again. But that's November in Melbourne for you. In spite of the alternating sunburn and frostbite, it's one of the busiest months in the garden. We're planting tasty summer crops, but also those autumn and winter crops that need long growing times. 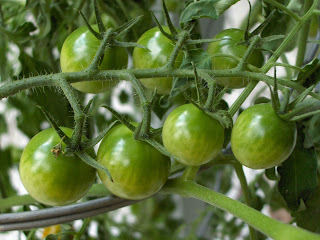 It's officially tomato planting season now there's enough warmth in the soil to give them a good head start, along with all the other plants we often cook with tomatoes like capsicum, chillies, eggplant, zucchini and basil. The biggest decision for November is which tomato variety to choose. We planted tree tomatoes in the community garden today - apparently they can grow to eighteen feet high! Along with all the mulching, watering, propagating and weeding, there's plenty to be going on with.